Powers/Abilities: McHeath possessed the average abilities a R.C.M.P. member needed (tactical training, shooting, etc.) and he had also all the knowledge to run an antiterrorist organization. With his battle-suit he possessed the ability of flight and enhanced durability. A sensor in his wrist enabled him to follow the electromagnetic particles he used to mark Alpha Flight. His weaponry included rockets and cannons. (Marvel Fanfare I#28/2 (fb) - BTS) - Commander Giles McHeath worked 50 years for the Royal Canadian Mounted Police. In his time he saw Front de Libération du Québec (FLQ) kidnappings, troops aiding the police, civil liberties suspended, sometimes he even got beaten up. After the October Crisis he saw countless innocents being trampled in the war against the FLQ. The same years Cell Combattre slaughtered several policemen on Christmas. Many FLQ terrorists were caught, but never Cell Combattre. McHeath retired after 50 years and started his own antiterrorist organization. With a battle-suit based on a prototype designed by the late (at this time at least) James McDonald Hudson for a company called Am-Can he became the vigilante known as Scourge with the goal to kill all Cell Combattre members. (Marvel Fanfare I#28/2) - McHeath found Jacques Paradis, murdered him, and set the apartment complex he lived in on fire. The next day he summoned Alpha Flight to his bureau and told about Northstar's past with the FLQ. He showed them a picture of Northstar standing in front of the burning home of the deceased Jacques Paradis and then told them who this man was. After telling them about the assumption of a seventh Cell Combattre member, Northstar revealed his past as Cell Combattre's courier. McHeath asked Northstar to help the authorities find his former friends and ask them to surrender, but Northstar didn't want to do this. He went alone, followed by Alpha Flight. 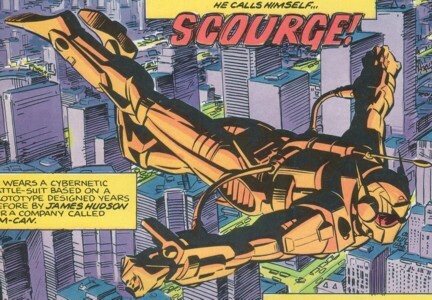 McHeath (who had secretly bombarded Alpha Flight with electromagnetic particles in his bureau) followed them as Scourge. He soon arrived at a theatre right behind Alpha Flight and killed Numéro Deux. The same tricked worked again and he was led to Numéro Trois and Lettre A. Scourge killed them when they tried to flee from their scrapyard. After a short conversation with Alpha Flight, Northstar decided to lead his team to the last Cell Combattre members. Scourge followed them again, and the next day in Toronto he saw Lettre B on his way home, but it was a trap set up by Alpha Flight. Box took Scourge to the ground, and the rest of Alpha Flight followed with their attacks. McHeath had to take off his helmet and everyone was shocked that he was Scourge. He told them that the government had stopped searching for Cell Combattre and that he wanted revenge for the policemen that died on Christmas. Angered by McHeath's fanaticism Northstar attacked him and beat him up with his super-fast punches. Alpha Flight stopped him, and McHeath tried to kill Northstar, but Snowbird knocked McHeath out before he could shoot. The police arrived and McHeath was arrested for his murders. Comments: Created by Bill Mantlo & Ken Steacy. I'd really like to know what he shot at his enemies. I don't know if a "WUMF!" stands for some kind of plasma, lasers or hot air. An armor a similar type was seen in Marvel Fanfare I#44. It was worn by the Canadian Major Colin Richard as Avro-X. 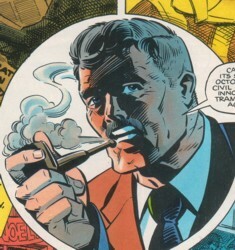 The story was also drawn by Ken Steacy.